As a tuner for AM/FM, Satellite, and/or Internet radio listening. As a preamp that controls which audio/video source is selected (Blu-ray Disc player, DVD player, VCR, CD player, Media Streamer, iPod, etc...), and processes incoming stereo/surround sound signals. Video from components (such as a Blu-ray Disc or DVD player) can be routed through the receiver to a TV if desired. As a multi-channel amplifier (5, 6, 7, or more channels) that sends the surround sound signals and power to the speakers, as well as providing a preamp output for one or more external powered subwoofers. In addition, many home theater receivers serve as a Multi-Zone audio distribution system. Multi-Zone is a function in which a home theater receiver can send a second, third, or fourth source signal to speakers or separate audio system(s) in another location. This is not the same as just connecting additional speakers and placing them in another room, nor is it the same as Wireless Multi-room Audio (more on this near the end of this article). Multi-Zone home theater receivers can control either the same or a separate, source than the one being listened to in the main room, in another location. For example, the user can watch a Blu-ray Disc or DVD movie with surround sound in the main room, while someone else can listen to a CD player in another, at the same time. Both the Blu-ray or DVD player and CD player are connected to the same home theater receiver but are accessed and controlled separately via additional onboard or remote control options available with the receiver. On many 7.1 channel receivers, the user can run the unit in the 5.1 channel mode for the main room and use the two spare channels (normally devoted to the surround back speakers), to run speakers in a second zone. Also, in some receivers, you can still run a full 7.1 channel system in the main room, provided you are not using the second zone set up at the same time. In addition to the method in #1, many 7.1 channel receivers are configured to allow a full 7.1 channel mode for the main room but provide an additional Preamp Line Output to supply a signal to an additional amplifier (purchased separately) in another room that can power an additional set of speakers. This allows the same Multi-Zone capability but does not require sacrificing the full 7.1 channel experience in the main room, in order to get the advantages of running a system in a second zone. Some high-end home theater receivers incorporate the ability to run both a Zone 2 and Zone 3 (or, in rare cases, even a Zone 4), in addition to the main zone. On these receivers, preamp outputs are provided for all of the additional zones, which require separate amplifiers (in addition to speakers) for each zone. However, some receivers will give you the option of running either Zone 2 or Zone 3 using the built-in amplifiers of the receiver. In this type of setup, the user can run the second zone with the internal amplifiers of the receiver, and a third or fourth zone using a separate amplifier. However, if you are using the receiver to power the second zone, you will still sacrifice the full 7.1 channel capability of the receiver in the main room, and have to settle for 5.1 channel use. In rare cases, a high-end receiver may provide 9, 11, or even 13 channels to work with for both the main and other zones - which decreases the number of external amplifiers you might need for other zones. In addition to the basic ways in which Multi-Zone capability is implemented in a home theater receiver, there are also some other features that may be included. In many cases, while the receiver can utilize both its full audio and video features in the main room, it may be that analog audio-only, or analog+internet radio functions are accessible for Multi-Zone use. If video functions are accessible for Multi-Zone use, they may be limited to composite video signals. What this means is that while you may be able to access a full high-definition video and surround sound audio source in the main room, only components connected to the receiver using analog stereo and/or analog video connections may be accessible for use in a second or third zone. However, it is important to note that in some higher-end receivers, it is possible that a component video or HDMI output may be provided for Zone 2 use. If these options are important to you, make sure you check before you buy. There may be additional speaker connections on the receiver that will allow you to connect a full 7.1 Channel as well as a second and/or third zone that can be powered by the receiver's internal amplifier. However, in this type of setup, if you are listening to the main zone in full 7.1 channel surround sound, you cannot use Zone 2 and Zone 3 at the same time. What happens when you want to access either Zone 2 or Zone 3, you will need to switch, via the receiver's operating menu, from a 7.1 channel main zone to 5.1 channels, enabling the extra two channels to power either Zone 2 or Zone 3 speakers. Some home theater receivers perform the above-described switching function automatically when the second zone feature is activated. Another interesting way to use the Multi-Zone capable home theater receiver is to use the second zone option in the same room as a 5.1/7.1 channel setup. In other words, you can have dedicated 2-channel, controllable, listening option in addition to a dedicated 5.1/7.1 listening option in the same room. How this setup works is that you would have the home theater receiver setup with a 5.1 or 7.1 channel configuration with 5 or 7 speakers and a subwoofer that you use primarily for home theater listening, but then you would have an additional external power amplifier that is connected to the receiver's Zone 2 Preamp Outputs (if the receiver provides this option) with the external amplifier further connected to a set of front left and right front speakers that you specifically use for two-channel audio-only listening. This setup option would work for those audiophiles that want to use a higher-end, or more powerful, two-channel stereo power amplifier and speakers for audio-only listening, rather than using the front left/right main speakers that are used as part of the main 5.1/7.1 channel surround sound listening setup for movies and other sources. However, in a multi-zone capable home theater receiver, both systems can be controlled by the same receiver's preamp stage. 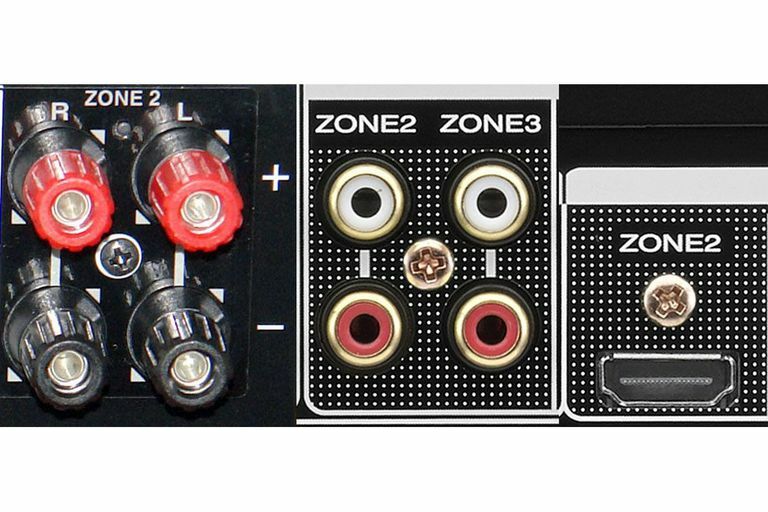 You don't have to have both the main and second zone features running at the same time - and you can lock in your two-channel source (such as CD player or Turntable) as your designated source for Zone 2. Many think that Zone 2 (or Zone 3 or 4) can only be used in another room, but that is not the case. Using the second Zone in your main room can allow you to have an independently dedicated (and controllable) two-channel audio system (using extra speakers and amp) in the same room that may also have a 5.1 or 7.1 setup powered by the receiver. Of course, this setup does add a little more speaker clutter to your room as you would have two physical sets of front left and right speakers, and you would not be using both systems at the same time since they are intended to be used with different sources. The concept of plugging into and controlling all of your components with one Home Theater Receiver is a great convenience, but when it comes to Multi-Zone capability there are still additional factors to take into consideration. Unless your receiver comes with a secondary remote control for use in a second or third Zone, you will have to go to the receiver in your main room to switch sources to supply to the second or third zone. Even if a secondary remote control is supplied for second and/or third zone use, you will still have to install remote control extenders in the second or third zone rooms in order to use the remote in those rooms to control the source you want to access from the main receiver. Whether you are using the home theater receiver to power your second and/or third zone speakers or using the preamp outputs of the receiver to supply an additional amplifier in the second or third zone, you still have to have either speaker wires, or audio/video cables, running from the main receiver to the second or third zone locations. Another alternative that is becoming very practical for whole-house audio (not video) is Wireless Multi-Room Audio. This type of system utilizes a properly equipped home theater receiver that can transmit stereo audio wirelessly from designated sources to compatible wireless speakers that can be placed around the house. Some home theater receivers include both Multi-Zone and Wireless Multi-Room Audio features - for added audio distribution flexibility. For full details on how a specific home theater or stereo receiver implements its own Multi-Zone capabilities, you should consult the user manual for that receiver. Most user manuals can be downloaded directly from the manufacturer's website. It is important to note that home theater or stereo receivers that have Multi-Zone capability are intended to be used when only a second and/or third location for music listening or video viewing is needed. If you desire to install an extensive whole-house wired audio or audio/video system, using your home theater receiver as the control point then you should consult a professional home theater or multi-room system installer to assess your needs and provide specific equipment suggestions (such as audio or audio/video server(s), distribution amplifiers, wiring, etc...) that will accomplish your goal. For examples of home theater receivers that provide various levels of Multi-Zone possibilities, check out our periodically updated listing of Home Theater Receivers - $400 to $1,299) and Home Theater Receivers - $1,300 and Up.